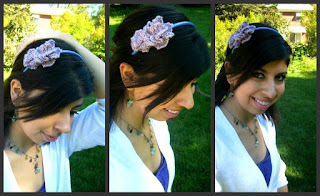 So I notice online and in fashion department stores are all kinds of headband with feathers, lace and flowers. I was close to picking one up and purchasing it when I thought to myself..." I can make this!" I am sure we all go around saying that :) but then when we get home forget about the whole idea and regret buying it in the first place. Well I almost had one of those moments...then I said hey wait I will try to do this. Being finished with studies I decided since I have plenty of time on my hands I will try to make. I picked up some sock yarn and went away knitting flowers ( you can do crochet to if you like) and sewed little glass beads in center of them and went to the doller store and purchased some headbands, plain headbands. I cut a piece of felt and sewn the flowers onto the felt that I hot glued onto the band. like a sandwhich with another piece of felt. The end result! I think came out prety cute! here is a link of a flower you can use on a headband or plain hat. http://www.berroco.com/exclusives/hannele/hannele.html In the whole venture I came across these cute little cup cake picture or place card holders! I had to get them. Are they not adorable? I decided to buy them for gifts....but I have to admit I will probely leave them on my shelf for myself hehehe :) I been finding myself favoriting alot of hats on ravelry. I think there easy and quick to make and take along with you on road trips or confernces. I had a friend see my hat collection. Hats I made and I traded with others. she wanted to buy them off me! 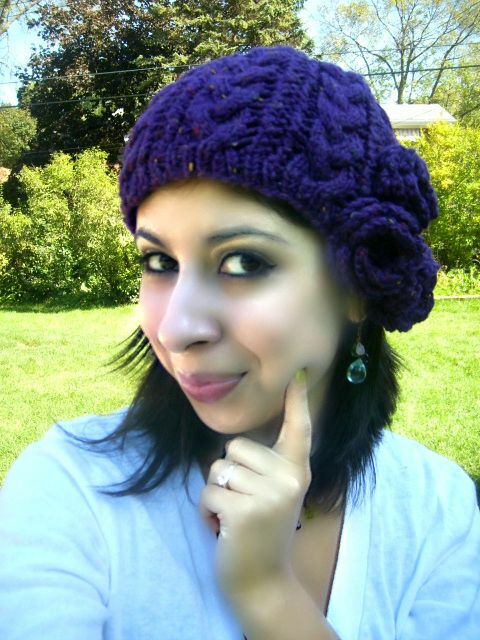 I said no :) but one of the hats she loved I designed and made. 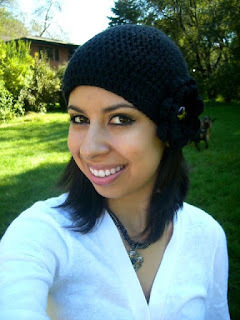 The black one is a crochet beanie style hat with a crochet flower in the center of the flower is a vintage button. I love buttons especially vinatge. I said to her, I can make you one but it will not have the same button. So she agreed and then she requested a purpe slouchy hat with cables and flowers and thats where, Insou comes in (pattern can be found free on ravelry). Here is some pics since I said I will be posting some of the things I been up to. Whats on my needles now? Onda su onda by Annalisa Dione in grey for my boyfriend. He actually request several things so I am crossing my fingers he will wear and use. Keep you updated if he does! These hats are great! I see why your friend would want to take some of them off your hands. 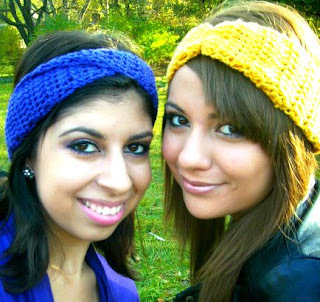 :-) I bought some headbands for the very reason you said too, but I just haven't gotten around to adorning them yet. I must get busy! Thanks for commenting on my blog. Have a great weekend!